Home Food and Dining Behind The Bars at Maverick Chocolate Co. 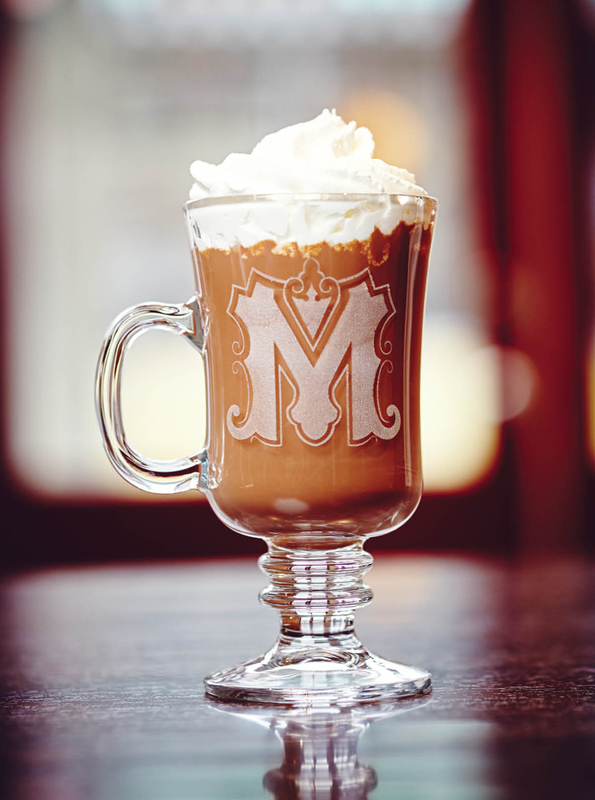 Behind The Bars at Maverick Chocolate Co.
Findlay Market’s stylish new chocolatier does it all in-house. The Picton family hard at work. 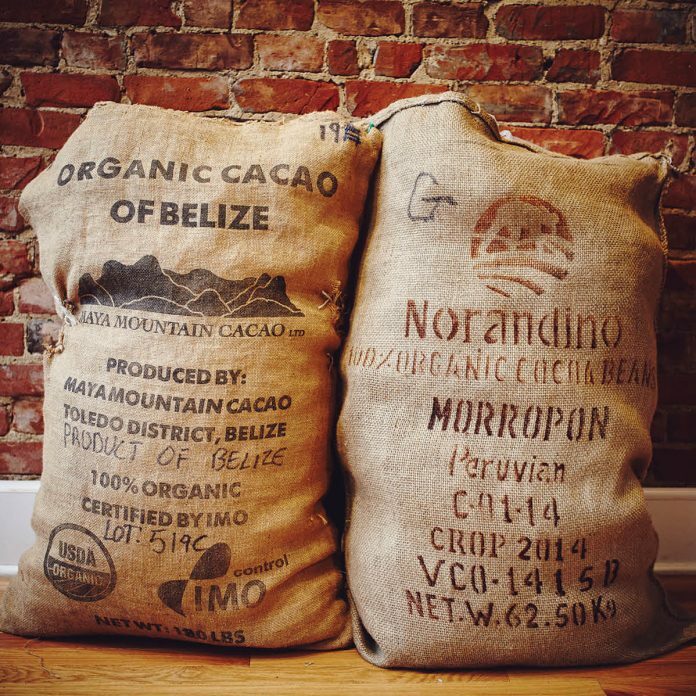 Of the many things the Queen City is known for, chocolate is not typically one of them. 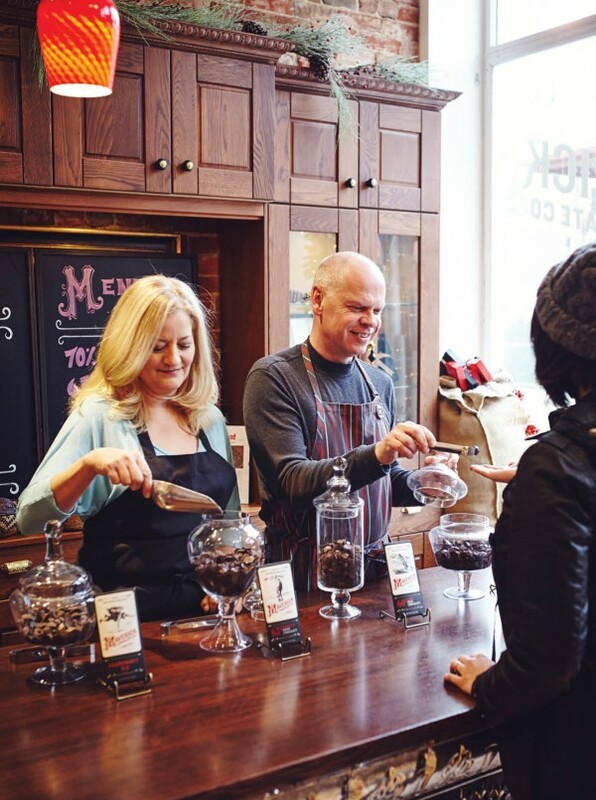 But Maverick Chocolate Company at Findlay Market—Ohio’s first bean-to-bar chocolate shop, which opened in July 2014—just might begin to change that. The chocolate connoisseurs behind Maverick are the Picton family: Paul, wife Marlene, and sons Scott and Benjamin. 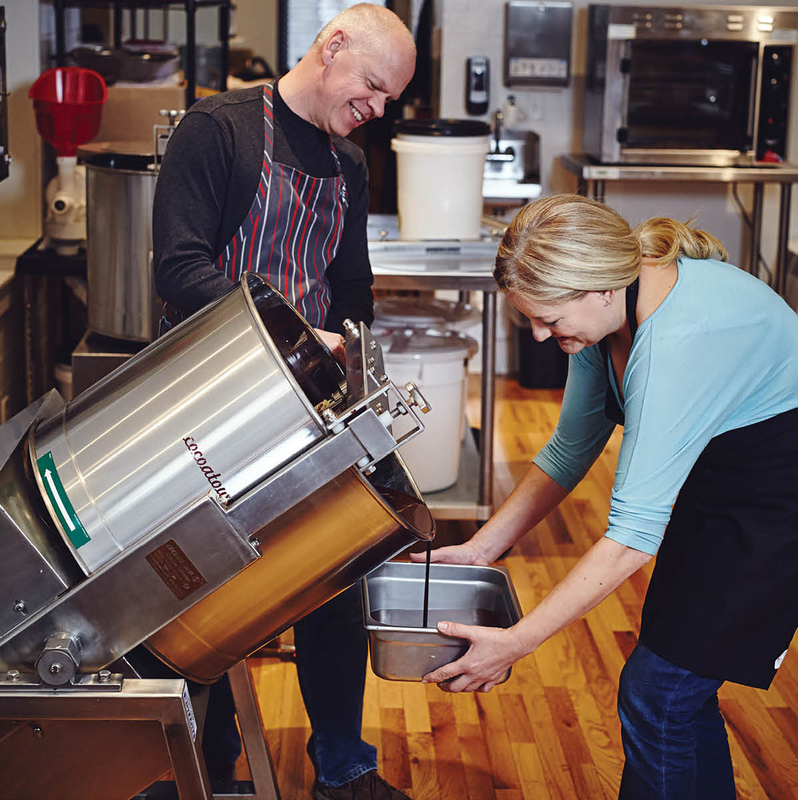 Paul, who spent 30 years as an aviation engineer before venturing into chocolate making, either handmade or retrofitted nearly all of their equipment—from roasters to winnowers to grinders—with help from Scott, a welder. Marlene is the primary chocolate maker and recipe creator, and successfully so: Their spicy Fahrenheit 513 bar, 70-percent cacao dark chocolate peppered with chilies, was a winner at the 2015 Good Food Awards. And Benjamin directs marketing and sales. Raw beans are hand-sorted to separate the good ones (shapely, solid, uniform) from the bad ones (flat, shriveled, cracked, or stuck together). Beans are roasted at 350 degrees for about an hour. 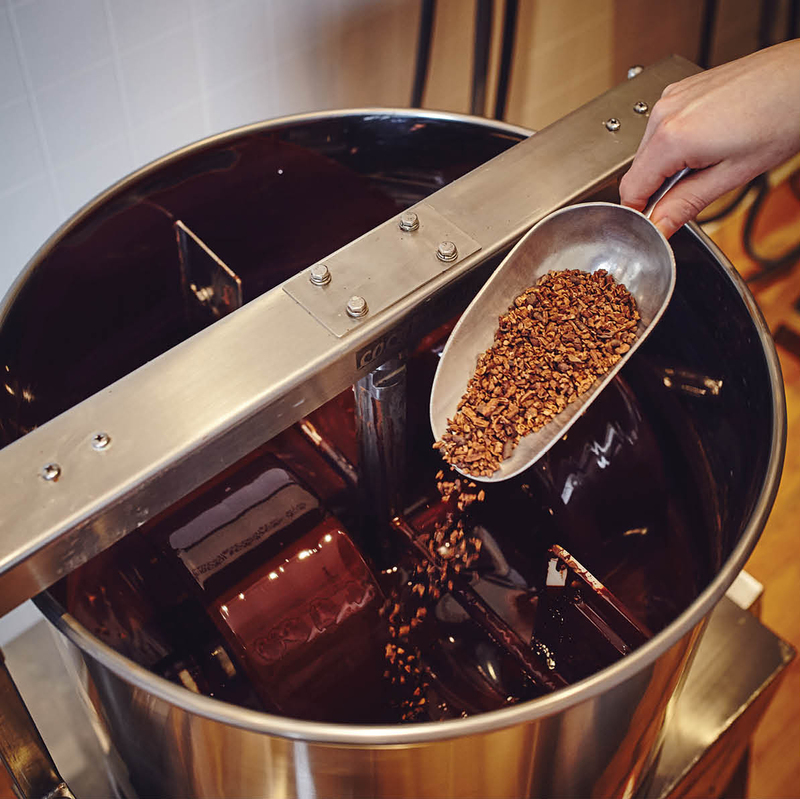 To get a roaster suitable for their micro-batches, Scott and Paul modified a chicken rotisserie. 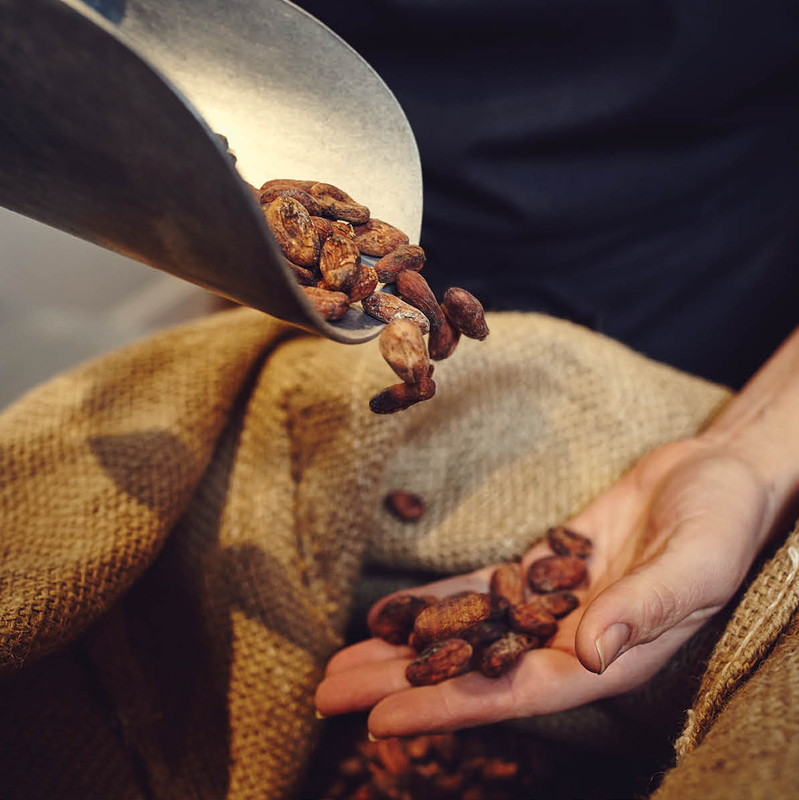 Roasted beans are cooled, then dumped into the cracker-winnower Paul made to separate the husks (pictured) from the nibs. Rivertown Brewery used their extra husks to make a brew called Captain Maverick’s Flyer—and it sold out in three hours. 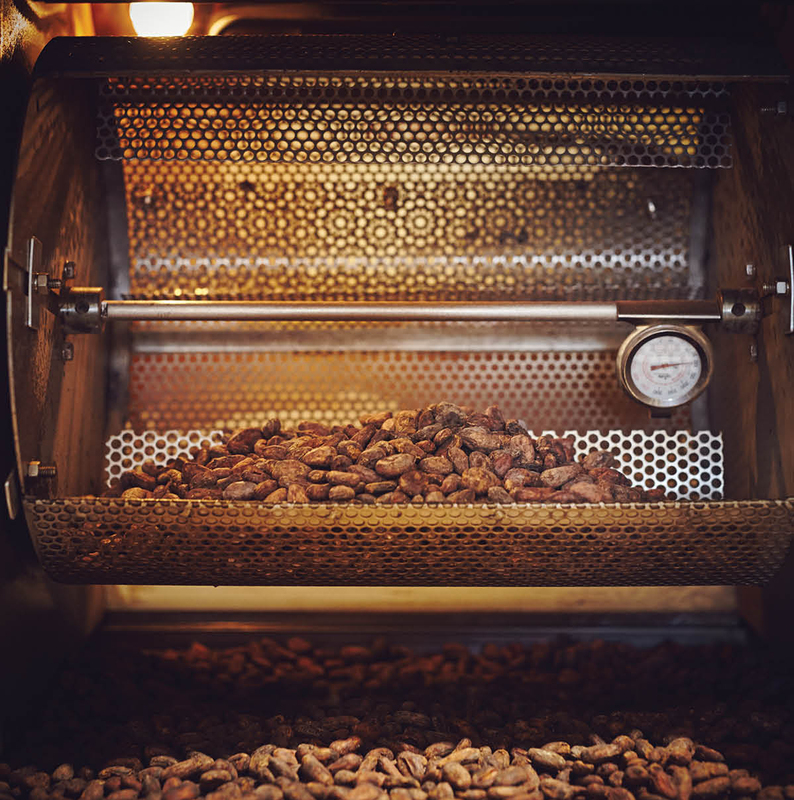 The cocoa nibs are added to the stone grinders, where they are ground continually for four days until they liquefy. Sugar or flavoring is added after the first day of grinding. 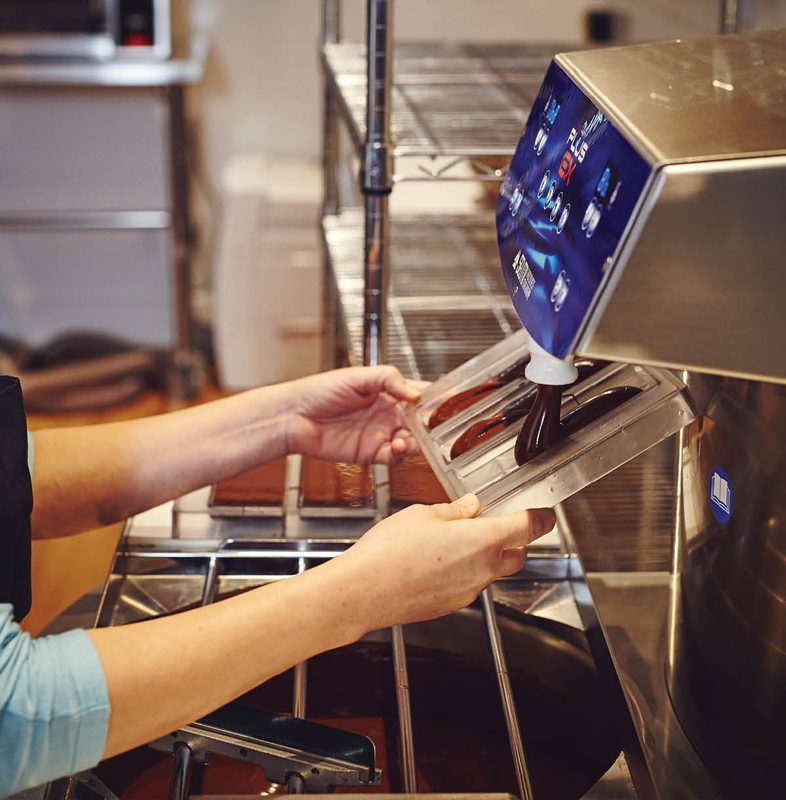 The chocolate then goes into what’s called a continuous temperer—a $20,000 Italian machine that Paul refers to as his “Ferrari of chocolate making”—which takes the chocolate through alternate heating and cooling cycles to make it stable at room temperature. 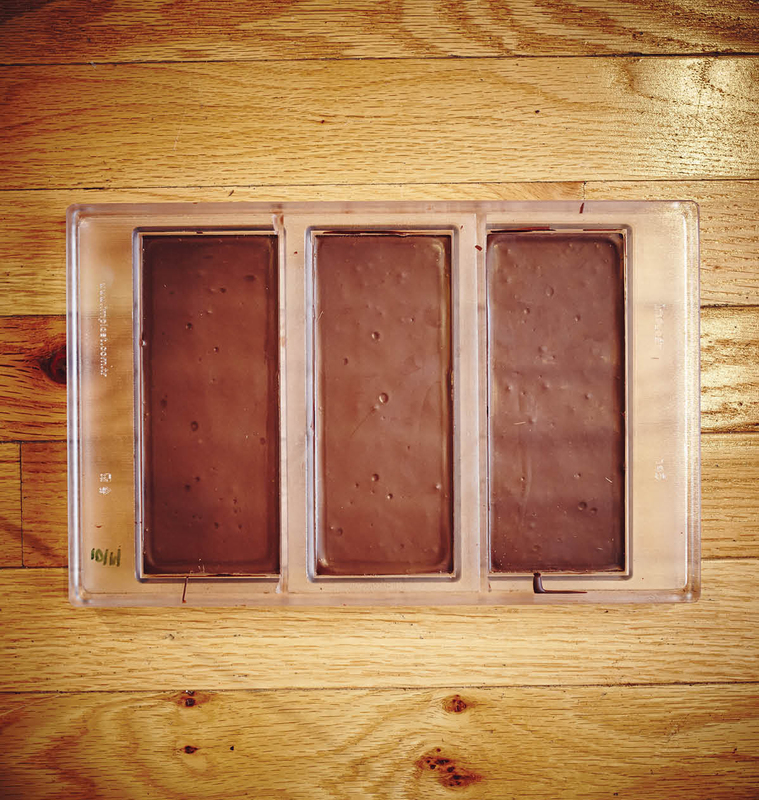 From the temperer, the chocolate can be poured into the molds. 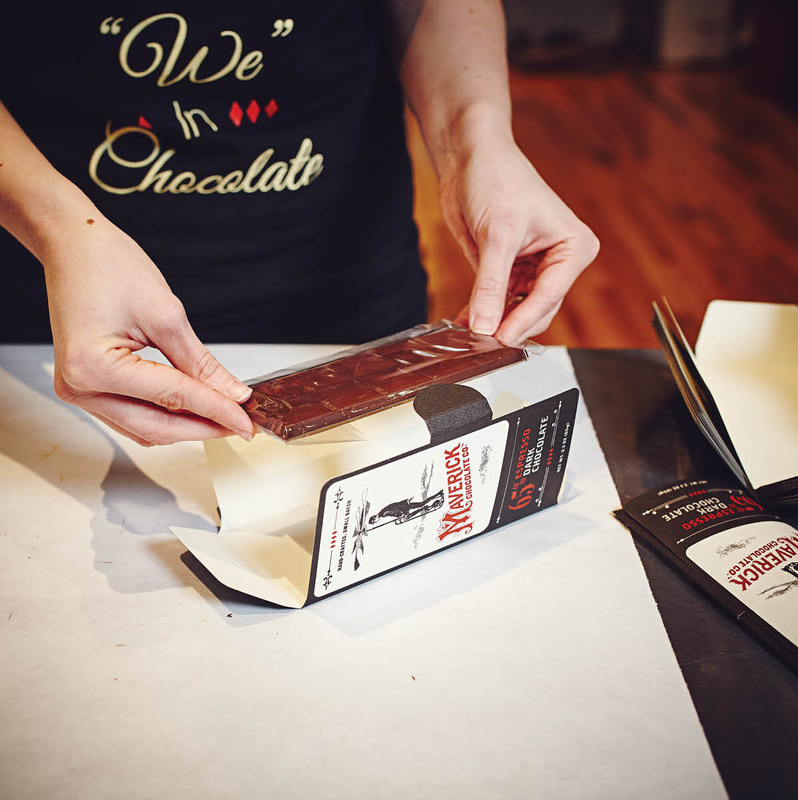 Once there, the bars are kept in low humidity to set and then be packaged. It takes about seven days to make a batch. Paul estimates that’s around 400 bars. 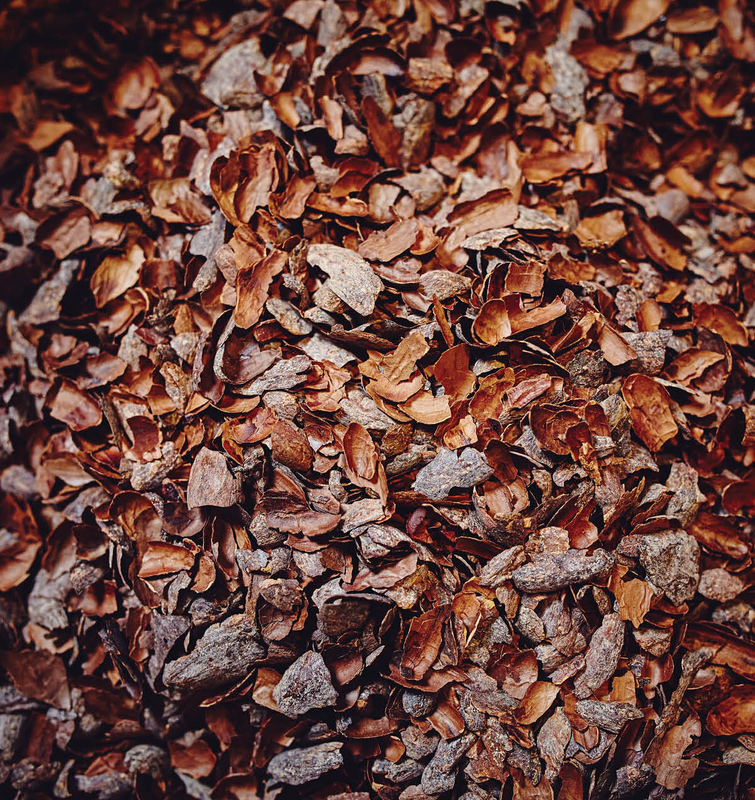 As for the total amount of chocolate going out their doors, Paul expects that Maverick will go through about eight tons of chocolate this year, with each ton producing roughly 15,000 bars. Now that’s a chocolate fix.